Assigning prices to a living, growing inventory is a variable and flexible process. Prices vary greatly according to species, size, vigor and aesthetic quality. All of our plants has been thoughtfully evaluated and assigned a price based on these criteria. If you have any question about pricing, please contact us! Our commitment to you is to grow quality plants, to offer them at a fair price, and to deliver them on time... we work on plant time! Please understand that nurseries deal with dynamic inventory, green and living, not canned. Plants grow, develop stronger roots, need to be re-potted to larger containers or moved into field growing conditions. There are times when plants should not be moved, dug, planted, or delivered except when they are dormant. Bare root plants should only be delivered during cool months. Weather conditions, drought or flood, unusual demand- any or all of these can affect our schedule. 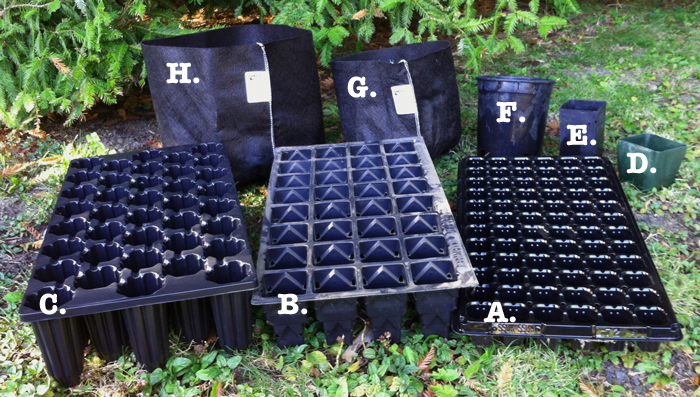 SmartPots®: various sizes of felt aeration containers, from #3 to #100! SmartPot® size matters! SmartPot® felt pots allow our trees to grow and thrive to sizes one might not expect per container size! Root balls will range from 12 inches to 32 inches in diameter. Plant Oregon guarantees plants that are planted and delivered from November through April. We evaluate every plant that leaves our nursery by checking its vigor and growth habits (in terms of that species) because we want to be sure it will perform well for you. We try to send out plants we would want to receive. With that said, the condition, growth, and production of plants after they have been delivered to a freight carrier are no longer the responsibility of Plant Oregon. We do not have a minimum order for plants picked up at the Nursery. If ordering large plants from afar, large orders are preferred to account for the high cost of freight deliveries. Every order is unique and we love to be flexible, so please talk to us about your ideas. 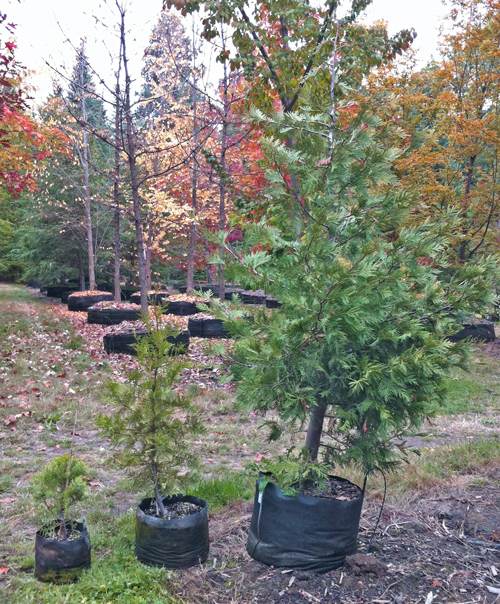 Plant and deliver options are available for Southern Oregon. When purchasing your plants, please include as many details as possible with your sales representative, including the date that you wish to receive the plants, the locations you would like them planted (if applicable), and any special directions to your location that you feel are pertinent. At Plant Oregon, we are striving to operate with a low impact on the planet. With this in mind, we prefer to schedule plant deliveries based on location, as well as timing and climate, in order to save fuel and lower our carbon emissions. We are all working hard together to provide you with accurate and efficient service. We accept payment over the phone by Visa or MasterCard, and in person by cash, check, gift certificate, or card. For large orders that will be shipped, note that we do not bill credit cards until orders are shipped, so that we charge only for plants actually shipped and shipping charges. Personal checks accepted from established customers, net thirty days. Past due accounts are subject to a 1.5% per month service charge (18% annual rate). We try to send you the plants you order in the sizes you prefer. It may be necessary to substitute a size smaller or larger than the size requested. The price would change accordingly. If you do not wish any size substitution, please note this when you order and we will respect your wishes.